Specializing in Great Lakes Tournament Fishing, charters are available from May 1st through September. Half day, full day and evening charters are available. Netminder Charters will accommodate your needs from beginner to expert angler. Onekama (see location), is located just North of Manistee, Michigan on Lake Michigan, and offers some of the best Master Angler spring Brown Trout , Master angler Steelhead and Master angler Salmon fishing. Also, Netminder Charters can help with your travel and accommodations. Our 33' Tiarais one of the most comfortable fishing boats on the market today, her wide beam and open fishing deck offers plenty of room for your fishing party. Features include a private stand up head, an eating area, an indoor cabin. We have state of the art electronics that include radar, auto pilot, color graph, electronic downriggers, and we have an extensive tackle selection. For more information about Manistee, Michigan, places to stay, maps and the history of our area. Click on the Manistee Convention and Visitor's Bureau logo (right). 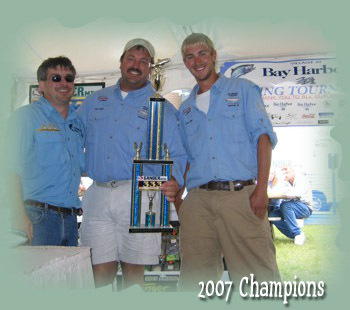 Specializing in tournament fishing for all size groups. Get the latest report on where it is hot! See what you can catch on your fishing charter trip. Starting at just $700 for a half day trip. Ladies - put together a winning team!